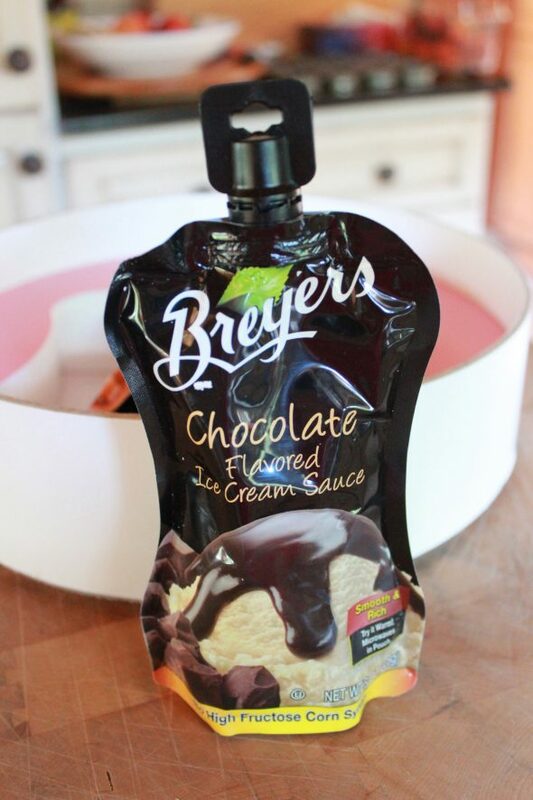 It’s been an ice cream kind of mood around here lately, thanks to warm summer weather and the generosity of Breyers Toppings.com. I was the fortunate recipient of this lovely package, filled with no-joke, over the top goodness – real fruit toppings, sprinkles and decadent sauces. 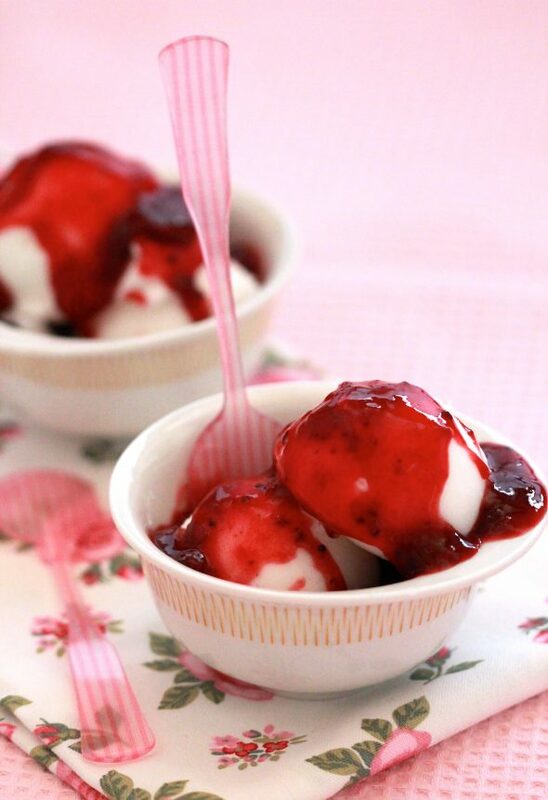 Besides simply delicious fruit toppings over vanilla ice cream (this one’s mixed berry and rivals the taste of my mom’s homemade jam – a big compliment! 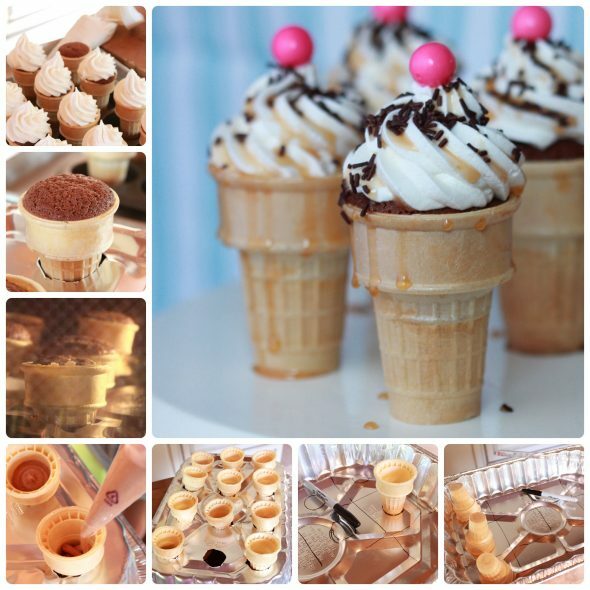 ), I used the chocolate flavored ice cream sauce in the batter for a special kind of cupcake – ice cream cone cupcakes! Pinterest-inspired and thanks to the directions of Allison of House of Hepworths and Courtney of Pizzazzerie, they were easy to make. 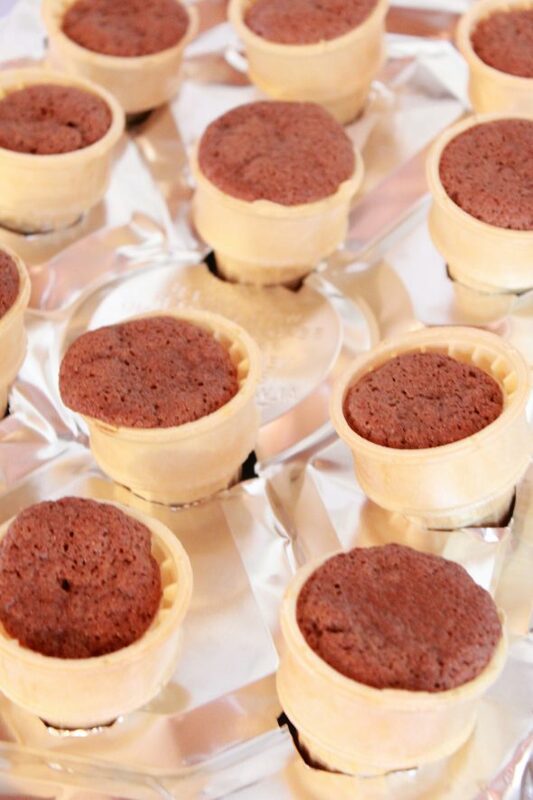 Thank you to Allison of House of Hepworths for the brilliant idea of using a dollar store aluminum pan to create an ice cream cone holder to bake the cupcakes in! 1. 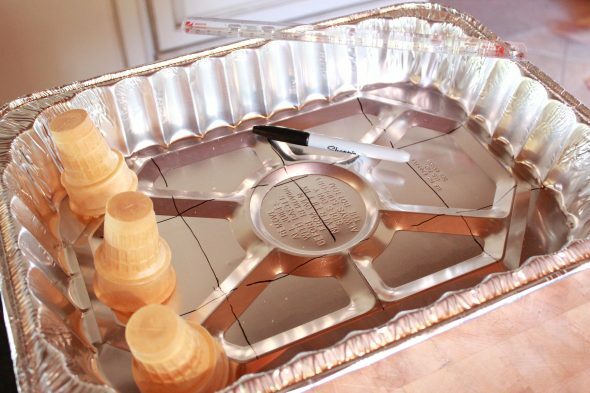 Section off the inside of your aluminum pan using a ruler and sharpie. 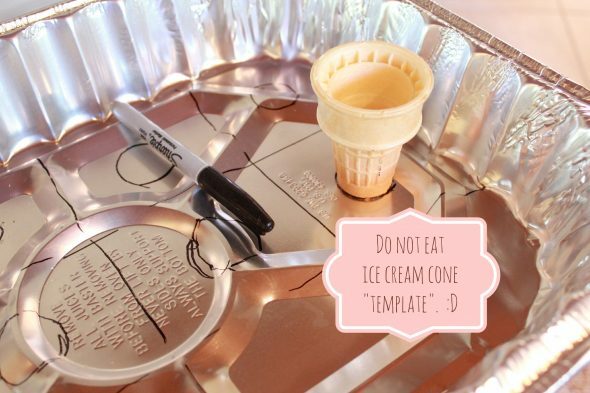 Use one ice cream cone as a template for the hole size you’ll need to cut for the ice cream cones. 2. 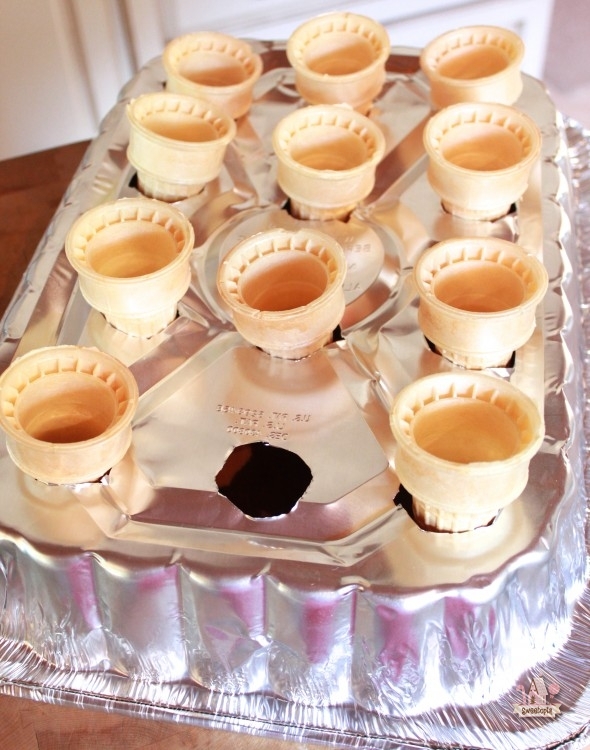 Cut the holes out for the ice cream cones with an xacto knife. I cut mine out on a cutting board, and although the pieces came out quite easily, be careful of the inside of the circle edges – they can be a bit sharp. Turn the pan upside down an place the cones in the holes. 3. 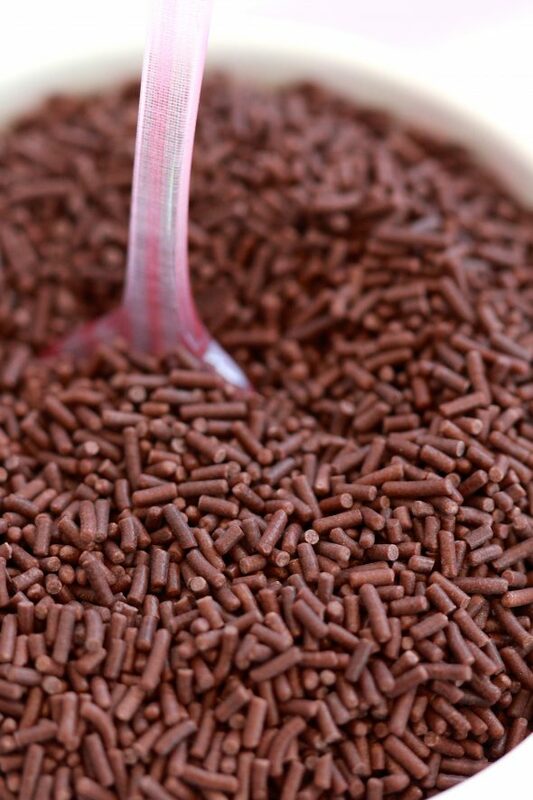 Make your cupcake batter. 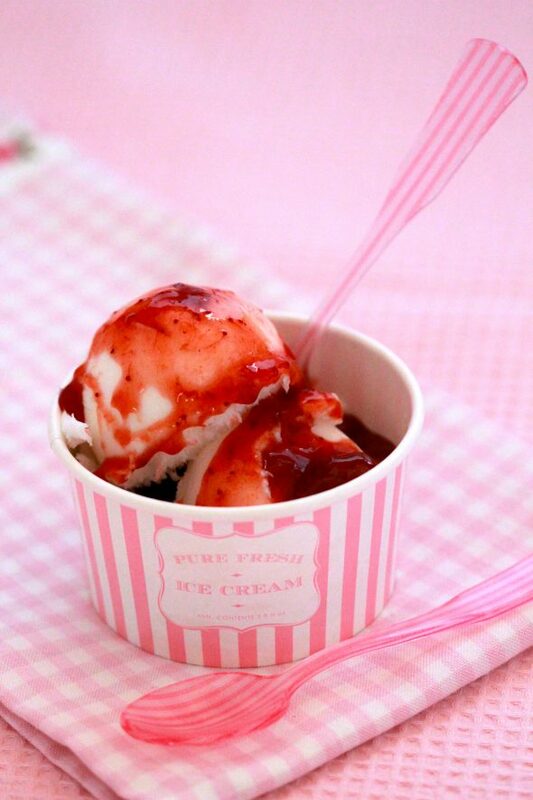 (Recipe follows). I made chocolate cupcakes using Breyers chocolate flavored ice cream sauce as my base. 4. 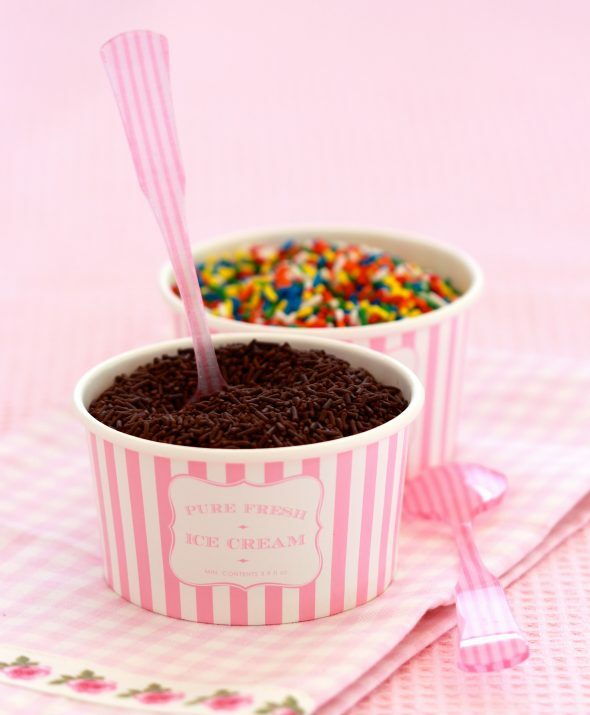 Once you’ve made your batter, pipe it into your ice cream cones, using a ziplock bag or disposable piping bag with the tip cut off. Spooning it in would work as well, but a ziplock bag or piping bag is faster, easier and neater. 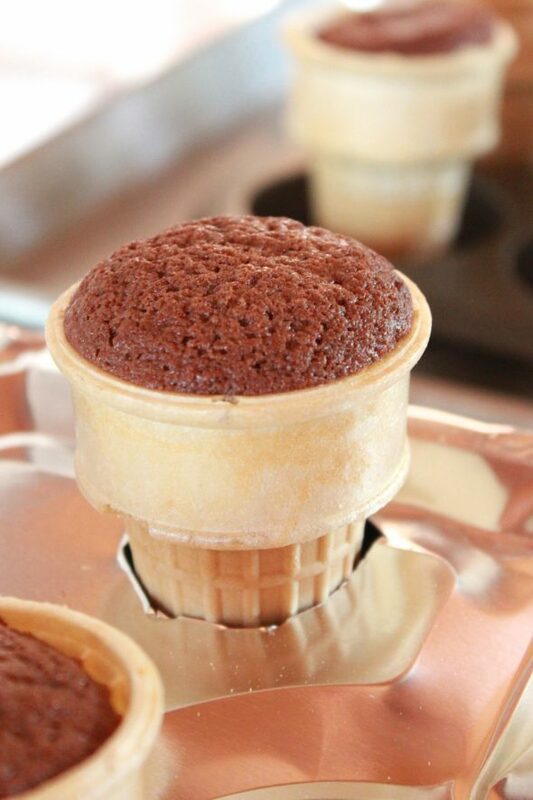 I piped about enough batter to reach the inside line of the cupcake cone. 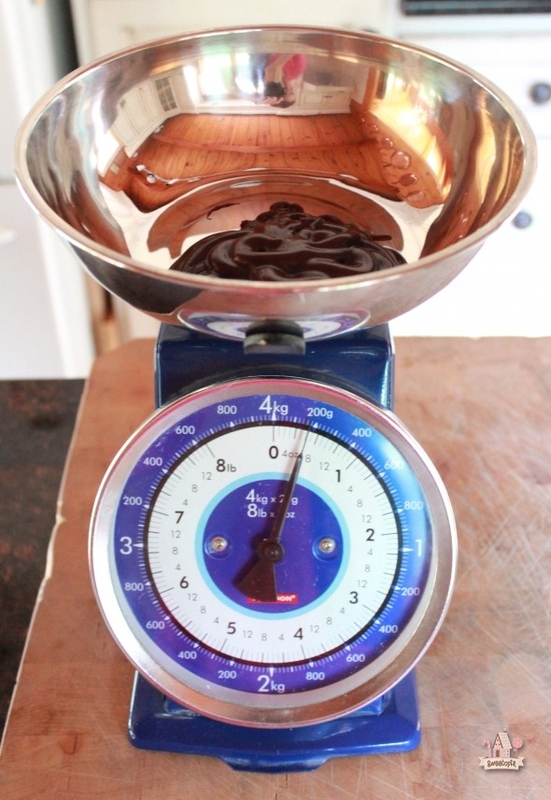 If you’d like your cupcakes to rise above cone level, fill the batter to at least about 1cm from the top. 5. 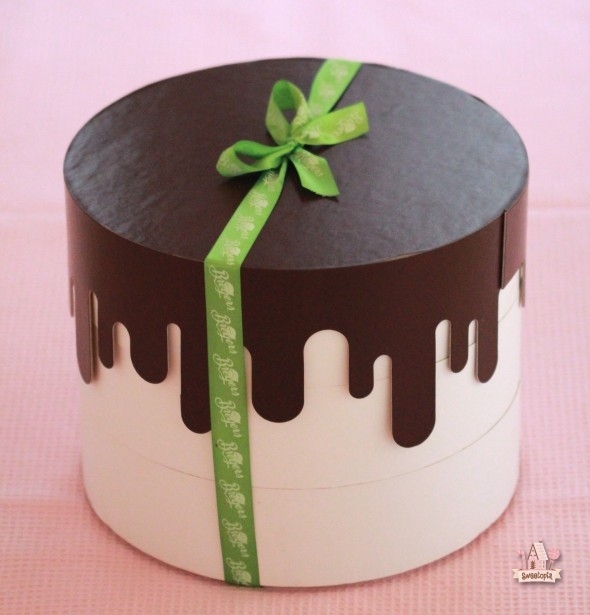 Bake for 20-25 minutes at 350 degrees Fahrenheit, or until a toothpick or cake tester comes out clean. 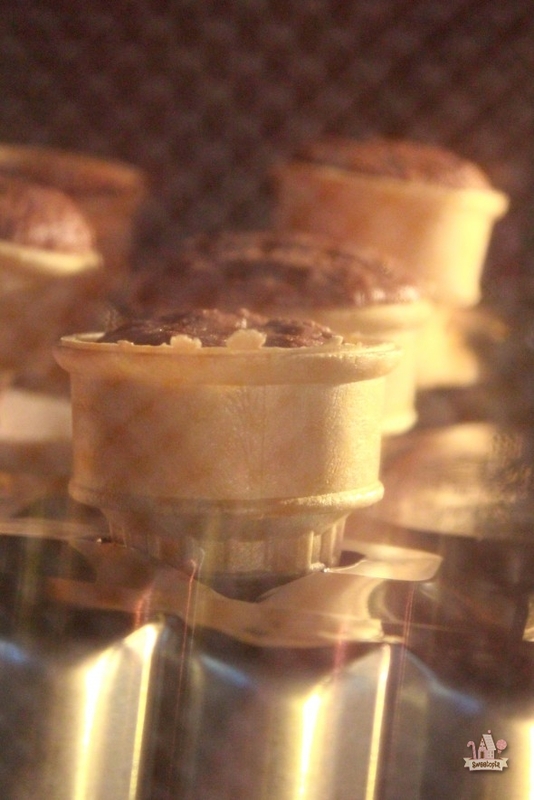 I noticed that it’s important to make sure the ice cream cones are standing perfectly upright, so that the batter doesn’t spill over the edge of the cones. 6. 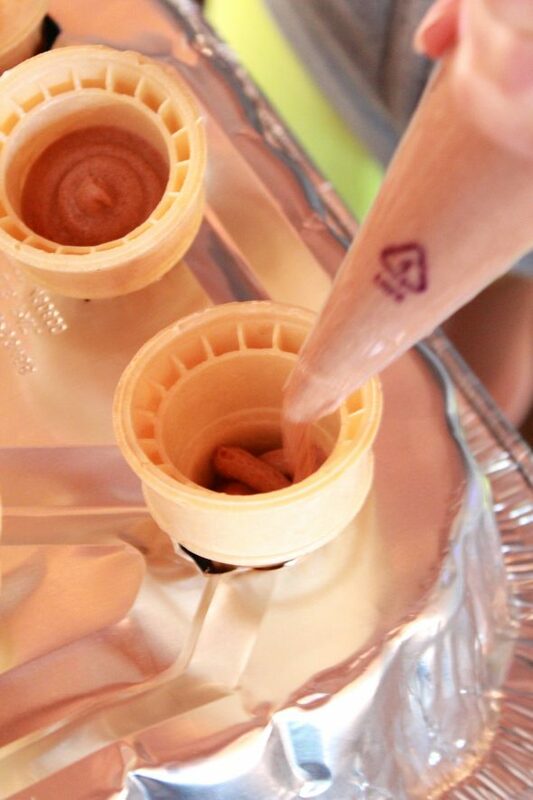 Once the cupcakes have cooled, pipe icing using an Ateco #829 tip (or tip of your choice). 7. 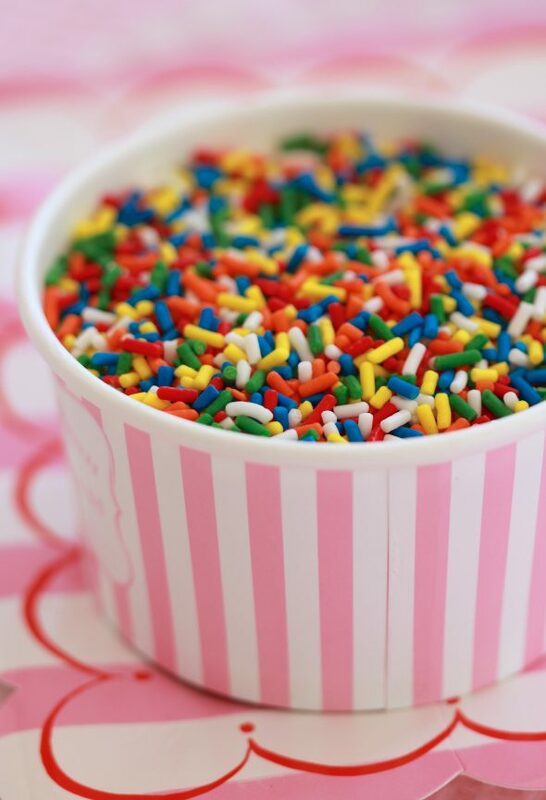 Garnish with sprinkles and or sundae toppings. It may seem that someone with a blog named Sweetopia, healthy eating may not much of a concern, but’s it’s actually the opposite. I have such a sweet tooth, but I always try to eat only small amounts of the treats I make, and focus on eating a healthy, balanced diet. 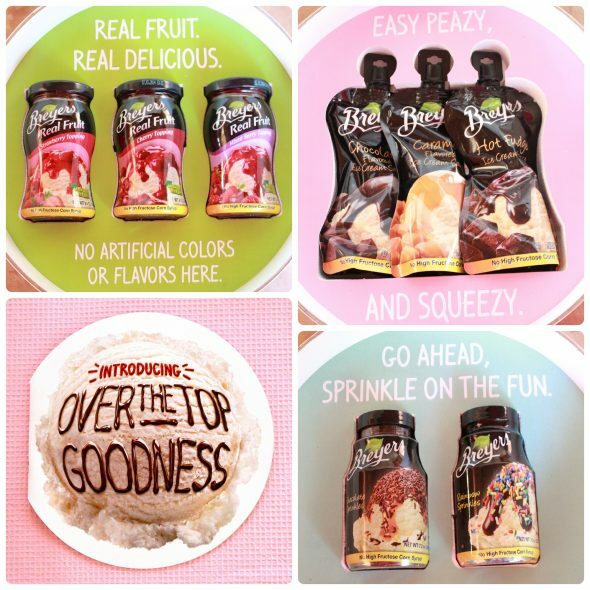 So, the fact that the Breyers sprinkles and toppings I’m sharing with you today, have no high fructose corn syrup, is an added bonus. 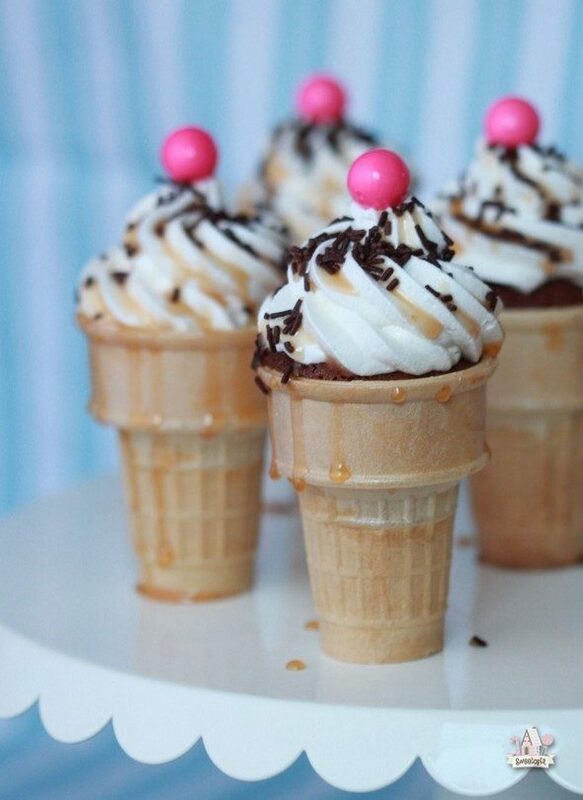 and easily dressed up my ice cream cone cupcakes. and a little pictorial summary for you. 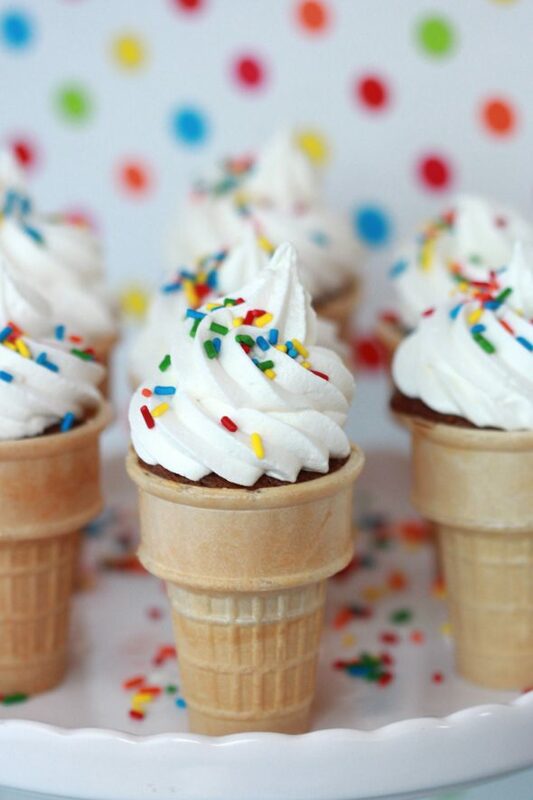 Whether you make ice cream cupcakes, or simply an ice cream sundae of sorts, both taste amazing and make the perfect summer treat for ice cream lovers of any age! Preheat your oven to 350 degrees Fahrenheit (180 degrees Celsius). 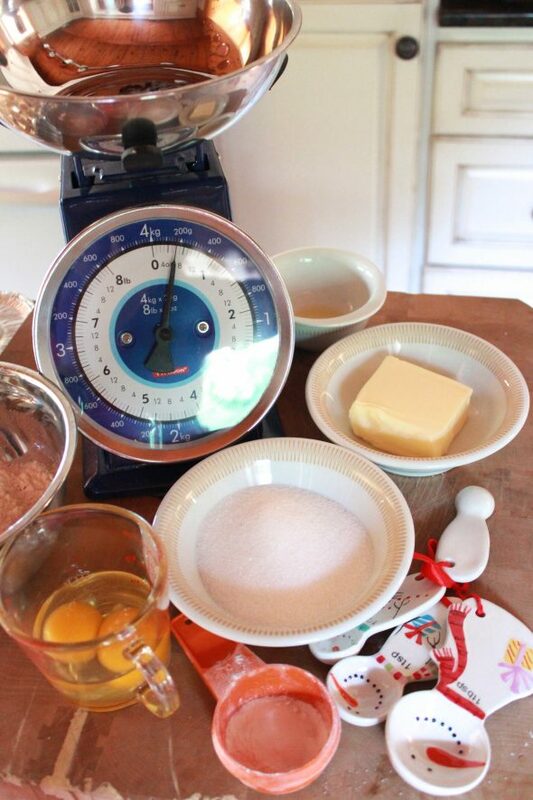 In a large bowl, beat butter with sugar until fluffy; beat in eggs, 1 at a time. 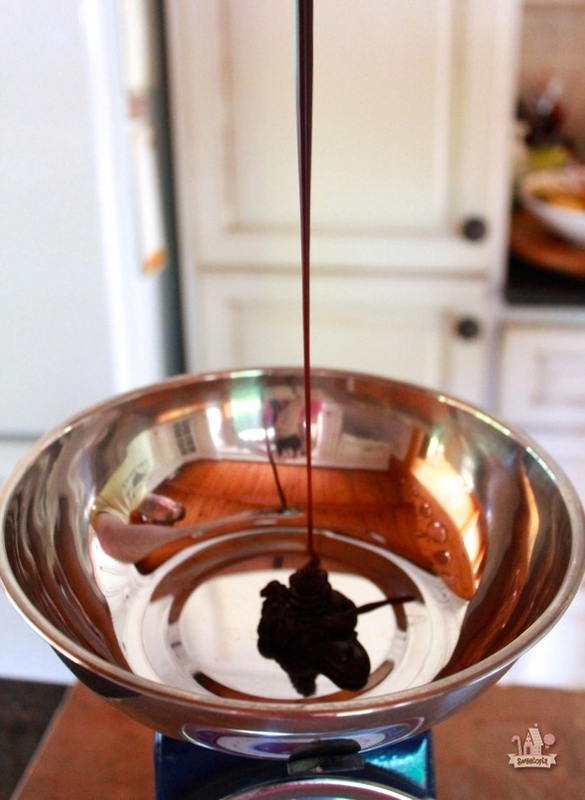 Beat in vanilla and chocolate sauce. Whisk together flour, baking powder, baking soda and salt; stir into butter mixture alternately with sour cream, making 2 additions of dry ingredients and 2 additions of sour cream. 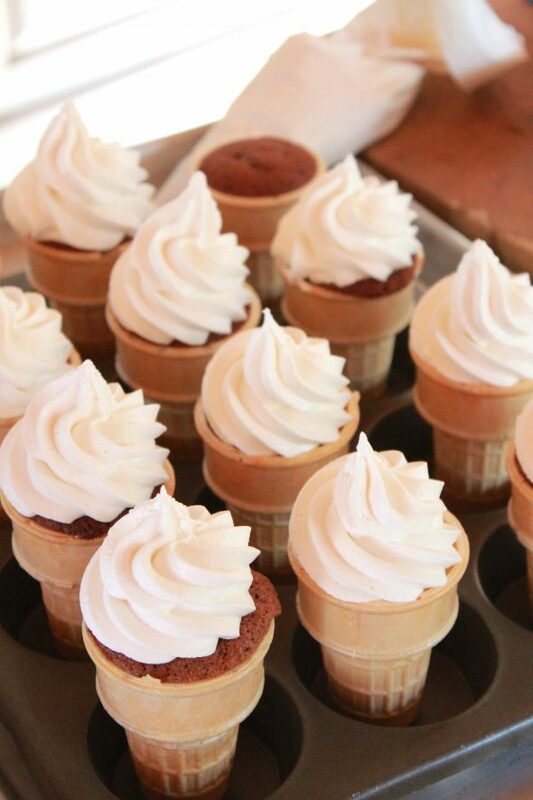 Using a piping bag or ziplock bag with the tip cut off, pipe the batter into the ice cream cones, filling to about 1cm from the top. Bake in oven until cake tester comes out clean, about 20-25 minutes. Transfer to rack to let cool. 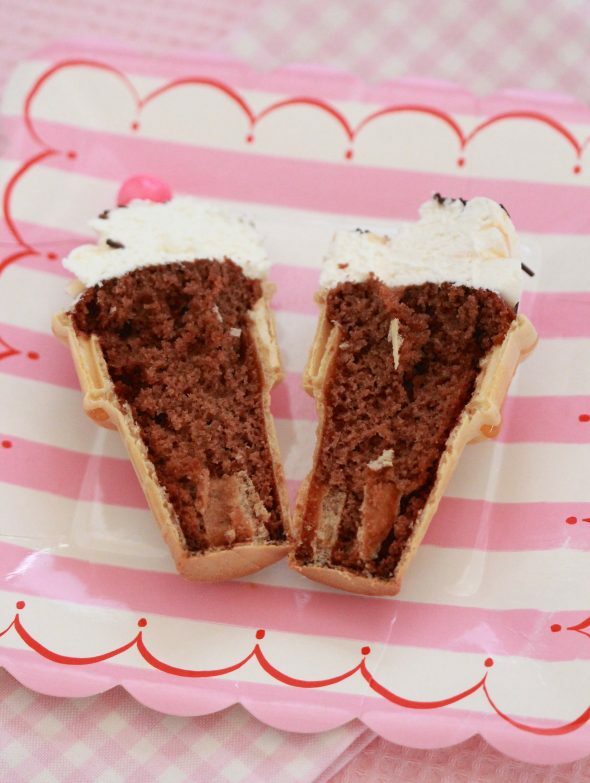 What are the pink balls on top of the cupcakes?